Step up to the ledge. A cool mist dampens your skin as the thundering water surrounds you. You’re heart may beat a little faster, your breathing may become a little quicker. Raw, untamed water plummets vertically. It is so primal you can feel it in your bones. Wells Gray Provincial Park is known for these waterlogged beasts. Welcome to the land of the waterfalls. Enjoy the other 39 named waterfalls and find others left as anonymous scattered throughout the park. Long before these frosty waters surged here, lave flowed freely. Today, this beautiful liquid dance will mesmerize you . The steady drumbeat of the falls burns into your senses and creates a life-long memory. Be prepared to be stunned as you walk on nature’s edge and witness some of the most dramatic geological viewing in British Columbia. Created ages ago, these ancient formations of shifting tectonic plates, frozen glacial activity and seething volcanoes show you how truly wild our wilderness is. 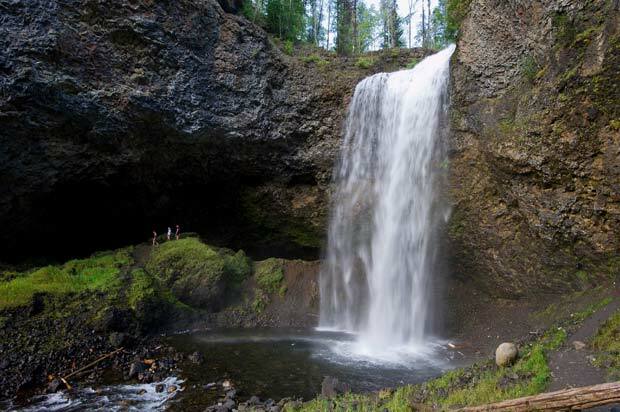 You’ll find over 40 waterfalls in Wells Gray, British Columbia’s fourth largest provincial park. 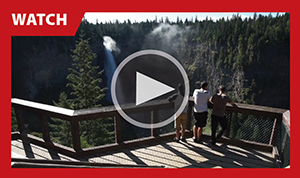 You’ll be awed by the height of Helmcken Falls. Take yourself on an invigorating trek to Moul Falls. Alternatively, head to the tranquil beauty of Dawson Falls for some peace and quiet. 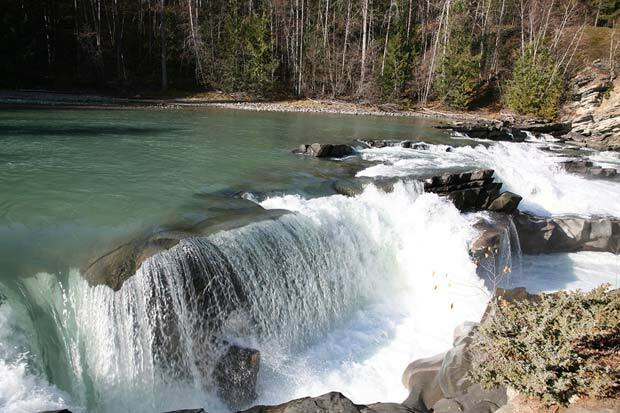 Witness the circle of life at Rearguard Falls in Mount Robson Park as the Pacific Chinook salmon return to their spawning grounds. 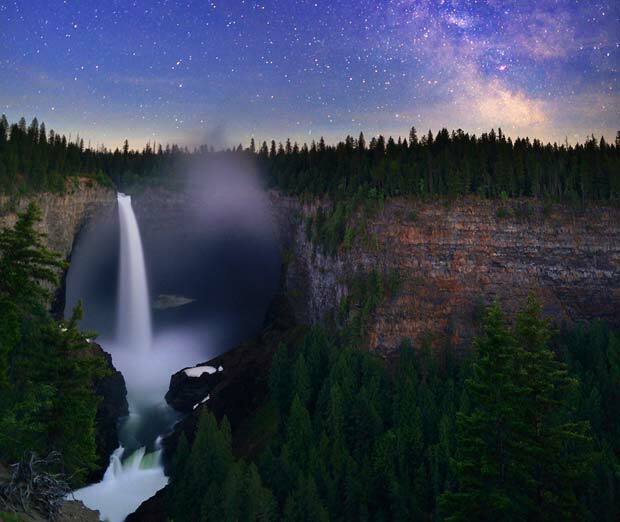 They say the heavens and nature meet at Helmcken Falls. Choose your view — at a distance, or up close. The viewing platform is easily accessible from the road and offers an all-encompassing view of the falls and canyon area. This deluge of water thunders downward 141m (463 ft), notably making it the fourth largest waterfall in Canada. 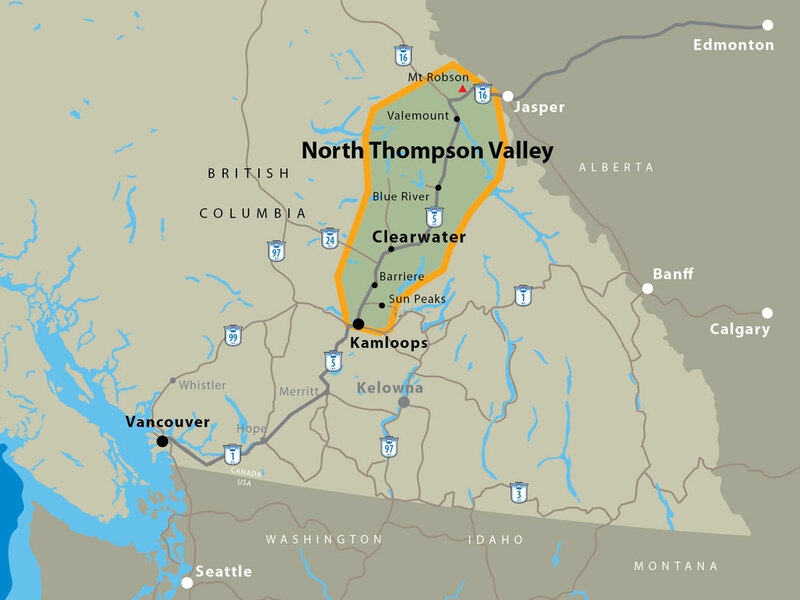 Watch in awe as the hurried water of Murtle River carves its way through the North Thompson Valley from a nameless glacier in the Cariboo Mountains. Seven waterfalls pour from this tributary, including the awe inspiring Helmcken Falls. Storming waters churn over land, creating ethereal movement, catching sunlight and creating rainbows. This balance of barbarian power and mystical beauty introduces you to the Canadian backcountry in a most unique way. For a different perspective, take the hour-long hike on the Rim Trail. Use the river as your guide. You can hear the water rushing more rapidly the closer you get to the falls. If you stand at the edge of the canyon you’ll feel the rumbling torrents up close. The sight of these falls is probably beyond anything you’ve ever imagined. An old-growth rain forest is your companion as you walk the easy 10-minute forested path that opens up to where Dawson Falls rumbles and rages. Extending 90 m (295 ft) across, you’ll be astounded by the sheer width of these falls. Be inspired as the surging water tumbles over prehistoric molten rock and swirls into Murtle River. Above all else, this spot is a tranquil haven and it may be just what the doctor ordered. Another great adventure is the one-hour trek from Clearwater road to Moul Falls. 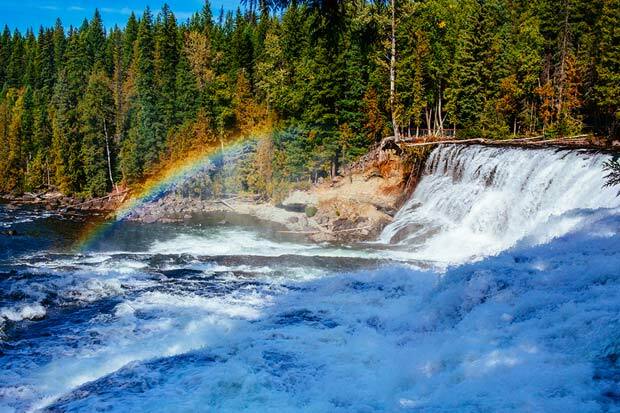 This energizing hike is one of Wells Gray Park’s best-kept secrets. Work your way down to the base of the falls where time and nature have eroded the rock face. As a result, you can slip behind the waterfall like a passage into another land. Mother Nature lives here, and her hospitality abounds. The clean scent of rushing water envelops you as the spray invigorates your spirit and you witness the raw command of a hidden den. 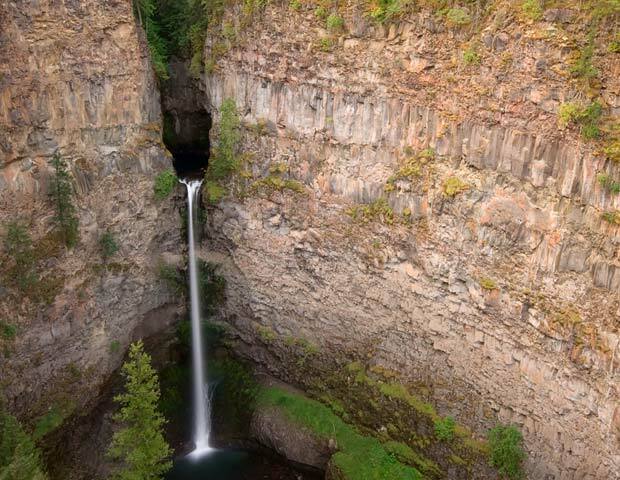 Picture-perfect and inspiring, Spahats Creek Falls is probably one of the most breathtaking falls located in Wells Gray Park. 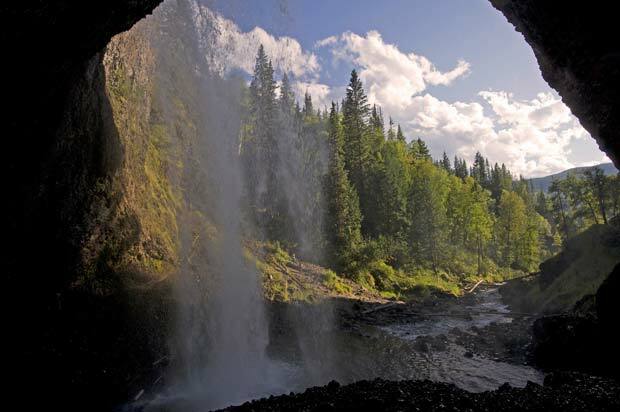 The deluge chutes forward through a hole in the rock as if from nowhere, down pouring into the Clearwater River. Marvel in the splendour of the brawny water, and the complete blanket of wilderness surrounding you, though you just left the road moments before. It’s a homecoming like no other. You can’t help but admire the salmon when they return to their spawning grounds. They arrive, battered and beaten, driven by an urge so strong that nothing but death will stop them. They swim against currents, battle their way upstream and try to jump the pounding waterfalls, usually to no avail. This usually marks the end of a life for one of our region’s most sacred creatures, and the beginning of the next generation. Late August is when the salmon return to Mt. Robson’s Rearguard Falls. Watch as the mighty Chinook salmon make their last run back to their spawning grounds from the Pacific Ocean. Come and witness the finale to this 1290 km (800 mi) round trip journey up the Fraser River to the falls. Rearguard Falls, in stunning Mount Robson Park, showcases these compelling swimmers fighting their way upstream. You’ll be amazed as they battle the powerful currents and try to jump out and over the falls. Don’t miss out on the world famous annual Adams River salmon run. The Adams River is one of the most important rivers in North America for the Sockeye salmon. Delight at the sight of millions of fish making their way back home to lay their eggs during the peak of the season in mid-October. Roderick Haig-Brown Provincial Park is the key site for trail access and platforms for salmon viewing, just make sure you bring your camera! 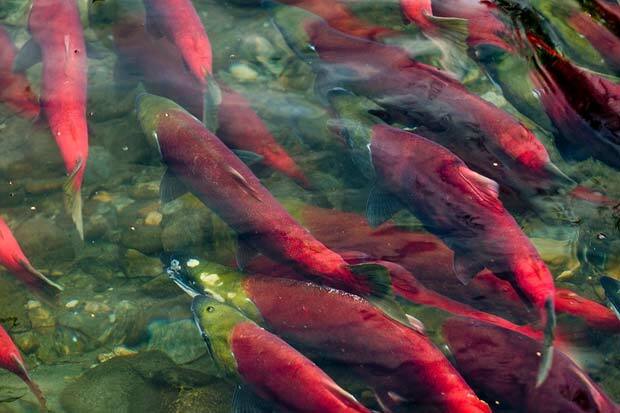 The Sockeye salmon have their highest return of spawning fish every four years. To celebrate the occasion, the Adams River Salmon Society holds an almost month long celebration, Salute to the Sockeye, during these peak periods. The next peak cycle is 2018.